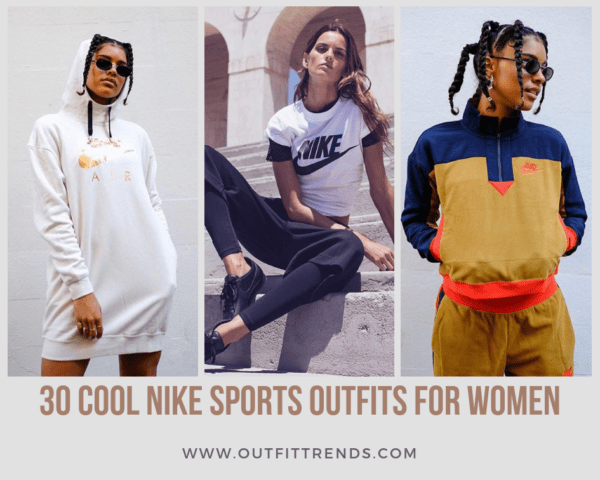 Nike Sports Outfits For Women: If you plan on delaying your workout to next year, you may want to reconsider your decision. It still is not too late to get back in shape before Winter kicks in. Losing motivation and discipline is quite easy especially when we are constantly bombarded with food images on billboards and spot fast food joints almost everywhere. We may just have the solution to your problem. Just how getting new stationery motivates one to hit the books, new workout clothes work the same way. It is not a bad idea to splurge on some fancy gym wear, every now and then, to help you break a sweat. Like Nike says, just do it! Here is some inspiration featuring cool yoga pants, sports bra, tracksuits and more to help you get fit and healthy again. Make sure to wear the right kind of trainers for your workout. Wearing socks is a must unless you do not mind getting the athlete’s foot. Jeans are not meant to be worn to the gym. Do not wear a regular bra to your workout or you could experience pain in your shoulders and upper back. Invest in a good sports bra that gives a good elastic fitting, supporting you well. Do not wear outfits that restrict muscle movements. Avoid accessorizing your workout look. Do not wear makeup to the gym unless you want your face to look like a sweaty mess. Remember to feel comfortable and confident in your skin. Working out is not only meant to lose some pounds but is rather about being healthy. 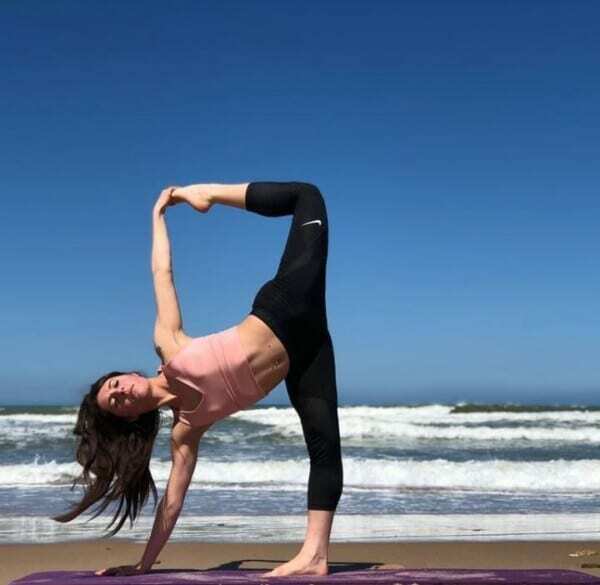 The 10,000-year-old form of Physical and Mental Exercise, Yoga, is a great way to connect with your inner self and to get back in shape. Yoga is commonly practiced with bare hands and feet and you may not require trainers for this form of workout. While Harem pants are commonly worn during Asanas, they are most appropriate for advanced Yogis. For someone who is a beginner, it is advisable to wear pants that enhance your flexibility. Nike’s Yoga Pants and Sports Bra are just what you need for a comfortable experience. Here are 10 Super Cool Gym Outfits for Women. The first step before any exercise is warm-up and stretching of muscles, as it reduces the risk of injury. To be able to stretch well, it is essential to find outfits that enable your body to perform the exercises. Nike happens to be a worldwide favorite for the material of their clothes. Not only do they allow the body temperature to cool but also offer enough room to stretch. As Winter approaches, the options for work out keep reducing, however, that should not stop you from losing the excess pounds. A Great idea is to wear layers that can protect you from the cold weather but can also be removed as the body temperature rises. The Nike tracksuits are just what you need for the upcoming Winters. While leggings are perfect for the Winters, gym shorts are Summer appropriate. The key is to find the right pair which is breathable, light-weight yet stylish. Exercises like running and jogging can lead to skin chafing which can be prevented by opting for fabrics that are anti-chafing. These Nike gym shorts are a hot favorite for how functional they really are. Apart from being light-weight, the shorts offer plenty of breathable space. A common mistake done by many is to wear your regular bra to the gym. Not only does it leave you with a sweaty mess but can also lead to upper body pain. Sports Bra is meant to offer the support that a regular bra cannot and they should now be accepted as a necessity. The Nike support bra comes in a fabric that draws away sweat and is appropriate for exercises like Cardio, Dancing, and Cycling. One great aspect of Nike’s gym clothing is how accommodating they are in terms of sizes. Not only do they offer a great fit but also come in modern colors and designs. The flattering colors, designs, and styles are sure to keep you going for more. Burn your Thanksgiving calories and get in the holiday spirit with this cool Christmas outfit. Make use of the empty gyms around the holiday season by getting back in shape. The white bands and overall color reminds us of Santa and a healthy body is just what we may ask from him this year. While tracksuits keep going in and out of fashion, celebrities have made the most of them this year. The common choice of material is polyester but they can also be made in cotton. The Nike Tracksuits are widely praised for the different colors and designs they come in. Additionally, they can help keep you warm, dry and comfortable. While the Ballerinas are required to wear Leotards, you may want to stay comfortable while practicing your routine. What better than a pair of comfortable Nike leggings that help enhance your flexibility. Here is a pair of pants that is both comfortable and stylish. The colorful stripes and plain black sports bra seem to be going together really well. A trendy workout outfit may just be what will motivate you to hit the gym ASAP. A basic monochrome look can never go wrong whether it is the gym you plan or hitting or the field. The white and black look is a classic favorite and can be done in a number of ways. You should also check out these 20 Best Pilates Class Outfits for Women. We love how perfectly this outfit has been coordinated with the Pink Polka Dot Sports Bra, Blue Shorts and matching Nike Trainers. The outfit is Summer Appropriate and can be worn to the gym or the field alike. We get how boring Monday workout sounds like but push away those Monday blues with a super chic workout outfit by Nike. This all-blue look is a super cool one and is sure to impress many. With Valentine’s Day being only a couple of months away, here is some inspiration for what you can wear to your workout date (If that seems to be a thing). Wearing outfits that are physically pleasing can help boost your confidence, leading to an overall better performance. Looking good can help you feel good, as well, which in turn can increase your motivation. Finding the right length pants as a Petite girl can be a very tiring and stressful task. Most activewear brands do not cater to the needs of such women and they are left with pants that need to be altered. However, fortunately for many, Nike accommodates all body types and comes in smaller sizes as well. Additionally, they also offer in-store pant hemming for free. Their crop pants can also fit many short women and come in different styles as well. Having a gym or workout buddy increases your chances of staying committed and motivated towards your fitness goals. Dress up with your best friend in Nike’s comfortable yet trendy workout gear for the most effective and trendy burn out. Let’s face it. Black is an all-time favorite color and is one of the most flattering colors. We came across this all-black outfit and immediately fell in love with it. The key to working out is to find out if you are sweating while exercising, as it is the detox pathway of our bodies. Wearing sweatshirts and hoodies can help you sweat more. Additionally, they help you stay warm during Winters and leave you with no excuses to stay cozying inside instead of working out. The Nike TechFleece and Dri-Fit sweatshirts and hoodies are made to feel light while keeping you dry and comfortable. Squats train your thighs, buttocks, and hips while also strengthing the lower body ligaments. Squats can only be done to perfection in shorts that enhance mobility. It is also important for the shorts to prevent the thighs from rubbing against each other which causes chafing. These Nike shorts are super light-weight, breathable and enhance flexibility. This super girly and cute gym outfit is exactly what you need for an active summer. The vest and shorts are perfect to stay cool in the summer heat. Add in matching trainers and you are good to go. Here is some inspiration for your next workout. This gym gear is particularly for all kinds of body types and will remain flattering for all. The gym vest, pants and jacket are perfectly color coordinated to create a cool look. Here are 20 Gym-wear Ideas for Modest Look. The Nike Dri-Fit pants come in a sweat-wicking fabric to help you stay cool, dry and comfortable during your workout. What is particularly impressive about these pants is the colors, designs, and styles they come in. Work your way towards the perfect toned body with Nike’s super trendy clothes. Stay motivated and on track by working out at home with the Nike App and workout gear. Working out at home does not mean ditching the workout gear. Exercising in the right kind of breathable gear is absolutely necessary as it helps your body stay cool. Apart from that, having cool workout clothes also help motivate you to stay focused on your fitness goals. This comes as no surprise as Neon just made a comeback this Autumn. The Kardashian-Jenners love sporting their neons whether as dresses or workout gear. Nike’s neon sports bra is just what you need to stay up-to-date with the 2018 Fashion trends whether on streets or in the gym. Running is known to be good for physical health but what most people do not know is how beneficial it is for mental health since it can help reduce the symptoms of stress and depression. Finding a good running outfit can be stressful as you need to make sure the leggings do not fall off, you don’t get tangled in them and still feel confident in them. Nike’s running gear comes as a savior with the right kind of fabric stretch, length, and color. Make your run worthwhile with the trendy leggings by Nike. What better than going for a cool tracksuit on a boring leg day. This tri-colored outfit comes in fleece and is perfect for the upcoming winter season. Here is some inspiration for your next workout look incorporating some pink to it. The sweatshirt, bag, and trainers seem to be working well with the gray pants. The labeled bra straps seem to be the new ‘it’ trend of the year. The super chic style of the Sports Bras makes them a must-have. Moreover, the comfort and support they provide during a good workout are exactly what is needed of them. Pastels can be rocked during the Cold Season through to the Spring. The soft tone of blue is a sure shot mood lifter and can save you from a bad workout. Other pastels that can be worn include lavender, Mauve, Powder Pink, Mint Green etc. This combination of Blue and Gray is a cool one and can definitely be a mood booster. Choosing a Summer Outfit comes with struggles of its own. To save yourself from the Summer heat, it is important to invest in a sweat-wicking and light-weight outfit. Fabric that absorbs moisture from the skin, leaves your body temperature cooler. Additionally, it is a great idea to wear a hat that protects your face from the harsh sunlight. Make sure to choose the right length and fabric shorts to prevent skin chafing.